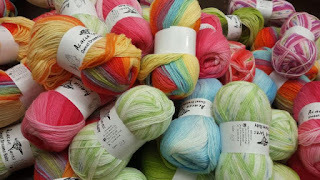 Yarn and Fiber Happenings: Rolling Waves Afghan in Superwash Worsted Yarn and Fairy Designs Project Bags are New at the Yarn and Fiber Company! Rolling Waves Afghan in Superwash Worsted Yarn and Fairy Designs Project Bags are New at the Yarn and Fiber Company! The Ivy Brambles Rolling Waves Afghan Pattern makes a fabulous crocheted afghan which is easy to make and can be made in different sizes. 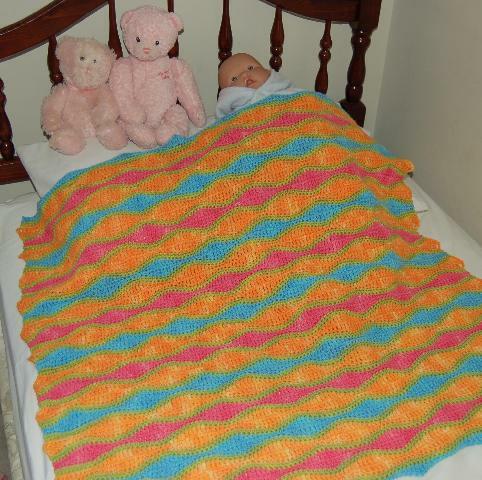 Directions and yarn requirements are given for a crib size blanket 35 x 35 inches (90 x 90 cm) through a 44 x 60 inches (112 x 152 cm) afghan. Other sizes can be obtained using the special notes in the pattern for increasing the width and length of this afghan. Pattern is shown made in Ivy Brambles Superwash Worsted yarn in semi-solid colors which adds movement to the waves as the colors gently roll through their color changes. Can be made in (2, 3) or 4 colors as shown - colorways used are Ivy Brambles Superwash Worsted Bluebell Woods, Spring Meadow, Day Glow, Pink Rose and has been crocheted using a size I-9 crochet hook. Fairy Designs Project Bags have arrived and they are very stylish, fun and versatile! Looking for a small bag that can do it all? Look no further! Our do-it-all drawstring bag is extremely versatile and has many uses such as a small purse with plenty of room for your wallet, keys, and makeup, or a reusable gift bag that is simpler and more eco-friendly than wrapping paper. It features easy-close drawstrings made of grosgrain ribbon that double as handles for carrying. It has been lovingly sewn in a fun and funky fabric on the outside and is fully lined. There are no exposed seams to get in the way, and the corners have been squared so the bag sits easily on a flat surface. The bag measures approximately 10" wide by 12" tall when laying flat. The do-it-all bag is great as a knitting or crochet project bag. It has plenty of room for 2 balls of sock yarn, your project, and a pattern. It’s also great for smaller projects such as scarves, hats, and baby items. The bag can hang from your wrist for on-the-go knitting. It’s really great for keeping smaller projects seperated in a larger bag so that the yarn doesn’t get tangled. The Reversible Project Tote from Fairy Designs is perfect for your knitting or crochet project. It has been lovingly sewn in a fun and funky print fabric on the outside and is fully lined. There are no exposed seams to get in the way. The bag measures approximately 11" by 11" by 3" deep and features both inside and outside pockets. Looking for the perfect bag for small projects? Look no further! These bags have been lovingly sewn in a fun and funky print fabric on the outside and is fully lined. There are no exposed seams to get in the way, and the square base allows the bag to sit easily on a flat surface. The bag measures approximately 6" by 6" by 6" and features a small inside pocket, and D-Ring with keyrings. The square sock bag is great as a knitting or crochet project bag. It has plenty of room for 2 balls of sock yarn, your project, and a pattern. The bag can hang from your wrist, or belt using the D-Ring for on-the-go knitting.